Crystal clear and as hydrating as water, this innovative rapid mousse is formulated to be as light as air, ensuring this product has a super fast absorption rate that will dry in 60 seconds and develop a beautiful golden olive tone over 2-6hrs+. This will become water resistant and last up to 7 days with no transfer onto clothes. That’s the dream and that’s what we’ve made happen. This tanning mousse is completely transfer resistant with no tinted guide colour. Streak free even tan without the mess and without the drama. Bellamianta are delighted to be supporting the Marie Keating Foundation in the fight against Cancer. 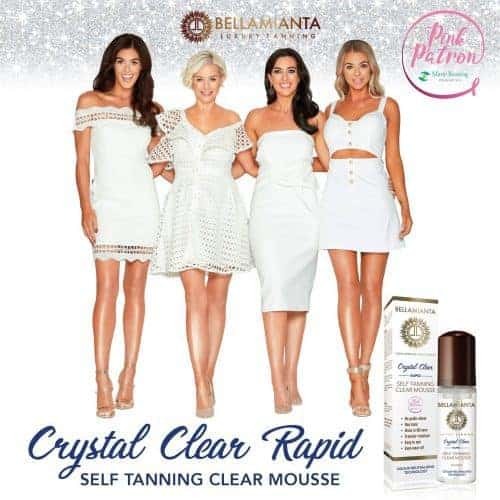 With our new Crystal Clear Rapid Self Tanning Mousse launching in October we thought it would be the perfect opportunity to help make a difference. With the sale of each one we will be donating 50 cent to the Foundation. Bellamianta Luxury Tanning products contain only clean, non toxic ingredients that help to nourish your skin whilst giving you a beautiful natural golden olive glow. Available online and stockist nationwide.